Regulators, proxy advisors and investors may be way off the mark in their views on executive compensation. Companies that consistently deliver strong shareholder return tend to do a lot of things better than the also-rans. Could one of them be the way they compensate their executives? Probably, but at the least such enterprises pay differently — and sometimes in surprising ways, according to a new Towers Watson report. This Occupy Wall Street protester in 2011 reflects strong societal sentiment on executive compensation. The consulting firm examined the executive-compensation programs at 50 companies with the most sustained and consistent outperformance in total shareholder return versus the S&P Composite 1500 over the past 15 years. The outperforming companies “take a range of approaches to differentiate their executive-compensation programs, sometimes in ways that many observers, including proxy advisory firms, would view unfavorably,” Towers Watson wrote in its report. In addition to proxy advisors, the report could provide food for thought for regulators and investors, which, according to Towers Watson, often have “quite narrow or rigid” views on what constitutes appropriate executive compensation. Stock options play a prominent role in long-term incentive (LTI) programs. The overall corporate trend is toward adopting LTI plans, but at high-performing companies, stock options represent about 50% more of the typical LTI mix than is found in the broader market. Target compensation is at the market median, but actual pay is consistently above the median. The median target for total direct compensation was quite similar for high performers and the overall S&P 1500, adjusted for company size. But at the former, median actual realizable pay significantly exceeded that of the latter — by 43% among large companies and 28% among small ones. Greater upsides in annual bonuses and LTI plans drove that result. The finding suggests that effective program design can ensure appropriate rewards for high performance. Correspondingly, it raises questions as to whether targeting above-median pay is a prudent practice. Compensation designs evolve as companies grow and mature. The study reinforced the importance of considering a company’s development stage when determining appropriate executive compensation design. For example, early in their life cycle, high performers used fewer annual incentive plan metrics (often one or two measures) but added metrics as they grew. Similarly, high performers used fewer LTI vehicles earlier in their life cycles — often only one — and added vehicles as they grew. “Often, we see commentary about pay that doesn’t consider the company’s development stage,” says Lippincott. The findings also suggest, though, that high-performing companies with revenue of $500 million to $2 billion are more likely than their similarly sized competitors to retain the less-complex incentive practices associated with early-stage companies. “In short, they keep it simple and focus on a few key goals,” Lippincott says. 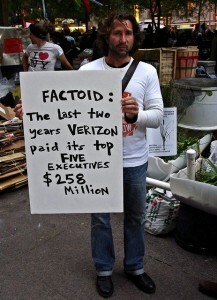 CEOs are a relative bargain. For CEOs, annualized realizable pay as a percentage of a company’s market capitalization — the “sharing rate” — was significantly lower among CEOs at high-performing companies. In short, such companies deliver high value to their top leaders at a significantly lower relative cost to shareholders. Photo: Flickr user David Shankbone, CC BY 2.0. The image was unaltered from the original. The two metrics are definitely negatively correlated, assuming the proper measurements are applied.